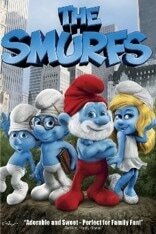 Read the summary of the 2011 Smurf movie. Identify the section of the passage for each element of the plot structure. 1 - As the Smurfs prepare for the Blue Moon Festival, Papa Smurf foresees a vision of Clumsy Smurf reaching for a dragon wand and the Smurfs in Gargamel’s cages. 2 - Hoping to avoid this, Papa Smurf refuses to allow Clumsy to pick roots. Disobeying Papa Smurf, Clumsy unintentionally leads Gargamel and Azrael to the village. 3 - The Smurfs flee for their lives while Clumsy runs towards the Forbidden Falls. Papa Smurf, Smurfette, Grouchy, Brainy, and Gutsy follow and find him. At the edge of a cliff, they are sucked into a gigantic vortex that spirits them to present day New York City. The Smurfs are befriended by the Winslow family and are invited to stay in their apartment. 4 - The next day, needing to find a star gazer (a telescope), the Smurfs follow Patrick Winslow to work. However, having extracted "Smurf essence" from a lock of Smurfette's hair, Gargamel arrives and tracks the Smurfs to a toy store where the Winslows manage to save the Smurfs from both the children wanting them and from Gargamel. 5 - At this point, Papa Smurf must calculate the night when they can return, and he needs to find the spell to do so. They venture to an old book store in the city and find the book containing the spell to turn the moon blue allowing them to return home. Gargamel sneaks into the book store and uses the dragon wand to capture Papa Smurf. 7 - Gutsy knocks the dragon wand out of the wizard's hand. Clumsy manages to catch it and sends Gargamel flying into a trash can that gets hit by a bus. 8 - The Smurfs use the spell to return home, leaving Gargamel and Azrael trapped in New York. The Smurfs then rebuild their village in the style of New York.